Yakutia Airlines, the only operator of Sukhoi Superjet 100 (SSJ 100) regional airliners in Russia’s Far East, has dramatically homogenized its jet-powered fleet as part of a capacity optimization drive. The carrier retired its Boeing 757-200s and 737-700s last year, and is now taking delivery of 737-800s. Further fleet expansion plans include a significant increase in the number or SSJ 100s, with the government’s help. The economic crisis hit Yakutia hard. Only a few years ago, the leading carrier of Russia’s Far-Eastern Sakha Republic was officially looking to break into the Top 10 of the country’s airlines, but in 2015 Yakutia did not even make it to the Top 20 in terms of the number of passengers flown, and is now asking the federal government for state guarantees. It has now been three years since Yakutia first started operating the SSJ 100 (the carrier currently has two of the type), but its Superjets never became commercially profitable. The airline, whose controlling stake is owned by the regional administration, blames the severe devaluation of the national currency over the past several months. When the board of directors approved the 10-year financial lease contract for the two aircraft in December 2012, undertaking to pay the lessor, VEB Leasing, a total of $62 million, the dollar exchange rate stood at 30.6 rubles. This spring, the carrier was paying at a rate of 67.8 rubles per dollar. The Russian government started supporting SSJ 100 operators financially a couple of years ago. The Sukhoi Civil Aircraft Company’s (SCAC) airliners are covered by Resolution 1212, which governs the allocation of subsidies to be used in lease payments by carriers. Also, the SSJ 100’s seating capacity makes it possible to use the airliner on the regional routes subsidized under the government’s Resolution 1242. A mechanism was introduced for ensuring the airliners’ guaranteed residual value. A program to subsidize a parts pool for the type should be launched shortly. Yakutia’s lucky break, however, came in the form of the government’s decision last year to increase the capital of the State Transport Leasing Company (known by Russian acronym GTLK), followed by the launching of a ruble-based operational lease program at reduced interest rates. Yakutia hopes that Resolution 1212’s action will be expanded in 2016 to cover operational lease agreements. In March 2016, Yakutia began implementing an agreement to replace its two SSJ 100s taken from VEB Leasing with two pre-owned examples of the type, to be leased from GTLK. Less expensive aftersales services could help improve the SSJ 100’s operational economics. 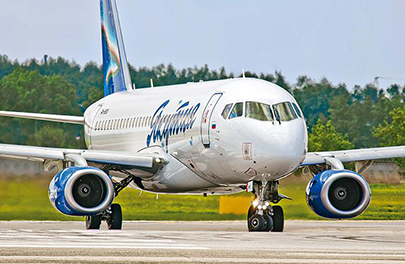 Yakutia Superjets’ OEM warranty expired in late 2015, upon their reaching three years since being built, after which SCAC subsidiary SuperJet International, which still holds monopoly on the SSJ 100 secondary market, offered the carrier much more expensive access to the parts pool. “We declined the offer, and have not since signed a new parts contract,” says Udod. “We arranged a deal under which our company would continue under the earlier contracts until the end of March (2016), while simultaneously negotiating the costs and scope of a new contract. However, we have not been offered an economically viable price to date. In the meantime, we requested a price rundown from SuperJet International, not just for the exclusive SSJ 100 parts, but also for components that are used on other aircraft types. Their pool comprises a broad variety of parts, around 500 different article types in total. I believe that, with the help from the Ministry of Industry and Trade and UAC [United Aircraft Corporation], we will secure acceptable terms that will help us make our SSJ 100 operation even more competitive. This summer, Yakutia’s SSJ 100s will be serving 17 scheduled routes, including to China and South Korea. The longest-range route will be between Yakutsk and Yekaterinburg (nearly 4,200 km, with a stopover at Novosibirsk); the shortest one will connect Yakutsk with Blagoveshchensk (1,300 km). The carrier’s newly introduced SSJ 100-operated route will be between Yakutsk and Yuzhno-Sakhalinsk, with a stopover at Khabarovsk. According to the information made available to Russian Aviation Insider by Anna Venzel, head of the company’s network planning department, five of the SSJ 100 routes will be subsidized under Resolution 1242. Yakutia is also planning to use its Superjets for charter flights to Japan, whose number is expected to grow in 2016. Since 2014 and until recently, the airline’s scheduled SSJ 100 routes have never exceeded 19. There were only 11 such routes in 2013, when Yakutia was still operating its only example of the type. Since the start of operations, each of the Yakutia Superjets has been flying some 220 hours per month on average. In late 2016, Yakutia expects to take delivery of the first of three new longer-range SSJ 100s under a contract signed with GTLK at the MAKS 2015 exhibition. The airline clearly intends to weather the economic downturn primarily with the help of Russian-built airliners, which have been rendered significantly cheaper to operate thanks to the government support measures. The carrier says it finds no particular faults with the SSJ 100. Passenger feedback analysis indicates that customers are happy flying on board Yakutia’s Superjets.